Calicut University degree 2nd allotment 2914 will be published on 5th July 2014 at 3 PM. Students who had applied for the admission can check their allotment status from the University website. The payment of mandatory fees and rearrangement of options can be done on 7th and 8th July 2014. Meanwhile the 3rd allotment including the reservation seats will be published on 10th July 2014. Calicut University, one of the popular academia in Kerala will publish the second allotment on 5th July 2014 at 3 PM. Applicants can check their allotment from the official web portal of Calicut University after logging into www.cuonline.ac.in/ the site using their application number and password. Those who get allotment should download the admission fee remittance chalan and remit the admission fee in any SBT branch through SBT Internet Banking, SBT e-chalan and Friends / Akshaya E-Chalan system. Students outside Kerala can make the payment through online banking facility. The payment of mandatory fees and rearrangement of options can be done on 7th and 8th July 2014. Those who got admission should report on 7th and 8th July at the concerned college. Meanwhile on these days, the colleges should report the details of the admitted candidates to the University online. The 3rd allotment including the reservation seats will be published on 10th July 2014 at 3 pm. Soon after the allotment, students who find their names in the third allotment must pay the mandatory fee and rearrange the options on 10th to 12th July 2014. The revised allotment timetable will help the students and parents to know the important dates regarding the Centralized Admissions Process (CAP). Students who are satisfied with any of their allotment should compulsorily delete the higher options. The commencement of admission to management quota will be held on 15th July 2014. The 1st year classes will commence on 16th on this month. The schedule of 4th and 5th allotment will be announced later through a notification. SC/ST candidates who seek admission can attend the spot allotment which will be done at the office of the University of Calicut. Students who have submitted online applications can check their second allotment status through their UG CAP profile page by logging in with the application number and password. Calicut University trial allotment result 2014 would be published on 19th June. Candidates who have submitted applications for various degree (PG/UG) courses through Centralized admission Process(CAP) can check the trial allotment result from the official website. Students can know the chance of getting degree admission in Calicut University through the trial allotment process and make necessary corrections in their applications before the prescribed date. Calicut University Calicut University degree online registration 2014 -15 also known as centralized ranking process 2014, single window online registration for admission in various degree (UG/PG) courses will commence soon at http://www.cuonline.ac.in/, the official website for online registration. Candidates who seek admission in Calicut University for the academic year 2014-2015 should keep an eye on the above website as it would help during the time of submitting the application form. 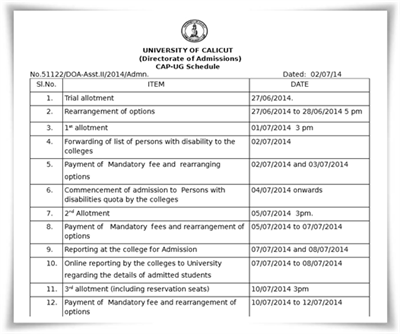 Calicut University Centralized Admissions Process (CAP) 2014 is currently available at http://www.cuonline.ac.in/. Go through the important instructions and key dates mentioned here. The University of Calicut, being one of the most prominent Universities in Kerala has taken initiative to introduce the Centralized Admission Process for admission to under graduate programmes in its affiliated colleges from the academic year 2014-2015. Calicut University degree online trial allotment 2014 list/results will be soon published at the official website of the University. After the registration process, the students were given time to make the final edit with the time ending on 10th June. After the final preparations, the Provisional Rank List & Trial Allotment will be published on www.cuonline.ac.in/, the official website of the University. Calicut University degree trial allotment 2014 date has been announced. According to the notification published in the official website www.cuonline.ac.in/, the Provisional Rank List & Trial Allotment results will be declared on 19th June at 3 PM. Following the trial allotment, students will be given ample time to modify and rearrange options. The first allotment will get published on 23rd June 2014.